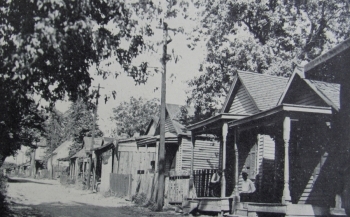 Many of the residential homes built in Davis Bottom were an architectural style commonly known as the “shotgun” house. This single-story, wood-frame home was built throughout the Southern United States from the 1860s to the 1920s. Shotgun homes are inexpensive, rectangular structures designed to fit narrow lots on urban streets. 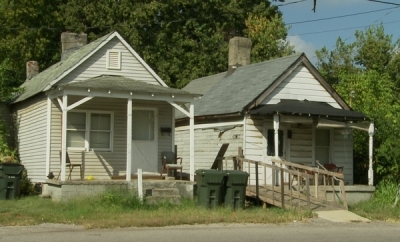 Figure 1: Two shotgun houses at 710 and 712 DeRoode Street, 2010. There are several theories as to the origins of the “shotgun” house form. Some scholars suggest is roots in ancient West Africa, Haiti and New Orleans (Vlach 1986). The term “shotgun” house may be derived from ancient African languages, or a modern description (unknown origin); the straight alignment of doorways would allow someone to fire a shotgun from the front door and out the back door without hitting any walls. published in A Comprehensive Plan of Lexington, 1931. 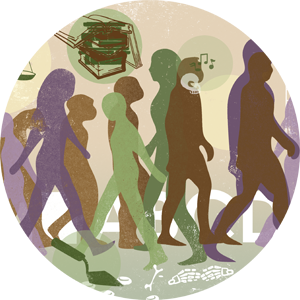 Full article on Shotgun Home, including historic photos, and educational graphics.